MILK THISTLE OIL – QUALITY GUARANTEED? Having problems with your livers functions? Working or living under stress and pressure, can affect your liver. And you feel tired, without energy and this affects your daily existence. And, without any treatment or care, this can be also very dangerous for your health. The choices that we make for our daily nutrition, can influence our livers functions. So, having a natural source of nutrients it’s a must. The researchers have made countless studies and have revealed a product that could sustain the needs of nutrients of our bodies. They have conceived Milk Thistle Oil, a remarkable oil with liver-supporting properties. Milk Thistle Oil is perfectly pressed and has a pleasant and smooth, malty taste. Your body will be naturally detoxified. The thousands of organic seeds are pressed with care and the process doesn`t affect the oil, it only enhances its properties. The UV-protective Miron glass bottles is a guarantee for zero rancidity because it protects the oil over time. The quality is guaranteed. 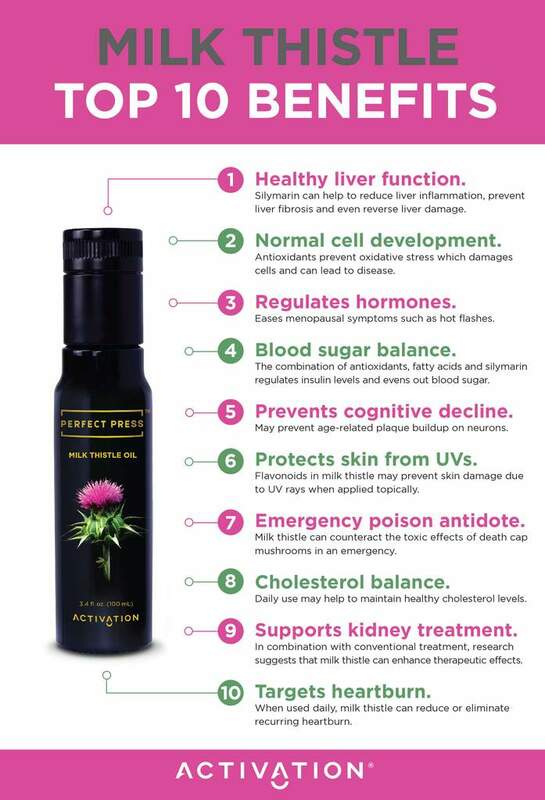 The Perfect Pressed Milk Thistle Oil restores the livers cell membranes, repairs weak areas and avoids liver damages. You feel healthier and your skin glows, it`s smooth and beautiful. Well-documented studies reveal that the main ingredient, silymarin, reduces or avoid inflammation in the different organs of the body. So, Milk Thistle Oil has an antioxidant effect, 10 times more powerful than vitamin E. Your organism will be less vulnerable. The Perfect Pressed Milk Thistle Oil its an organic product, that maintains the livers health. This product is bioavailable, vegan and no-GMO. Because Milk Thistle Oil supports the detoxification process and resolves the oxidative stress. So, the organs are less inflamed and the health is visible just by watching your skin. The body is nourished inside and out by this pure, potent oil. The process of obtaining the Milk Thistle Oil is based on Perfect Press Technology. It uses the most nutritious and highest quality organic seeds oil possible. At the base, these oilseeds are cold-pressed, but what makes the result this successful is the entire procedure (pressing, bottling, testing). The cold-pressing technology ensures that the organic seeds are not heated or damaged. The purpose when obtaining Milk Thistle Oil is avoiding disrupting the molecular structure of these seeds. Sourcing the seeds: We don`t use ordinary seeds, but only the best ones. We select it using 38 non-compromising criteria. Sampling and Testing: After completing the 1st step successfully, we order the samples. We run test batches for quality assurances. Delivery: We want our seeds clean and undamaged at our pressing facility, so we run a 15-in point checklist. Pressing: When pressing, we make sure that every drop of oil is extracted from the seed. In the same time, we make sure that the fatty acid chain or other nutritional components are not affected. Bottling: The oil properties are guaranteed by the UV-protective Miron glass bottles. More testing: We have unique methods of testing every sample, to make sure that the final product is qualitative and that there are no worries of oxidation. The manufacturing process being this stable, the Milk Thistle Oil is surely the best choice for your liver, skin and entire body. We certify the quality of our product, Milk Thistle Oil. You have the possibility to test-drive it for 60 days, with support from our customer loyalty team. We will offer you all the needed information and we ensure 100% satisfaction. If you are not entirely satisfied, you will get your money back. Don’t hesitate to contact us, for any question or concern. Milk Thistle Oil is a natural product, that will improve the quality of your life. You will see the difference shortly after starting using it. There are no side effects, so you can ORDER it TODAY! The more you buy, the best discount you get. So think smart! 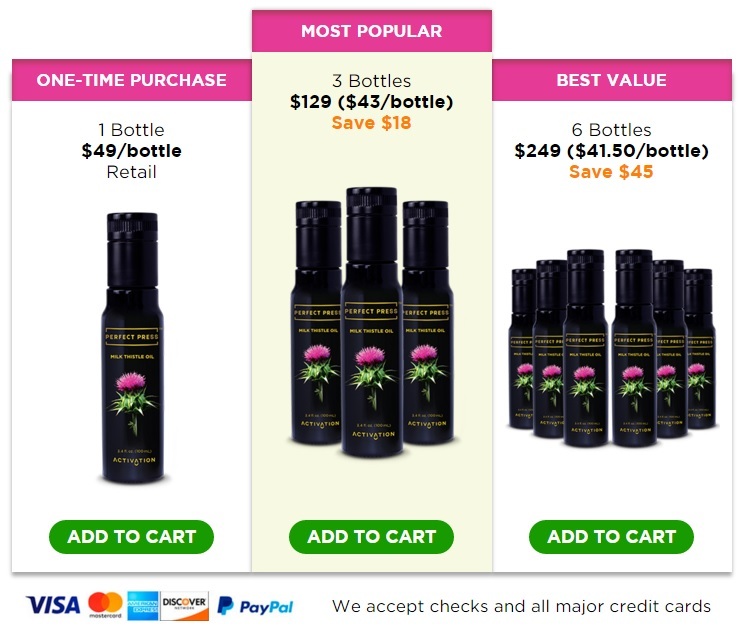 Chose the most suitable package of Milk Thistle Oil for you!